Free Lyrics Finder uses scripts to find and download lyrics from the internet. 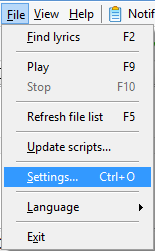 If you get wrong or unclean lyrics, you can try changing the order of scripts in the program's settings. Here we can see a list of scripts that are used by the program to find and download lyrics for your MP3, FLAC, APE, and other songs. You can remove a checkmark to disable the corresponding script, Free Lyrics Finder will not use it. On the right, there are two arrows. Click a script in the list and move it up or down the list. The program uses scripts in the order provided in this list, which means that the topmost script will be used as first. If no lyrics is found with the first script, Free Lyrics Finder will use the second one, and so on. At the bottom of the window, there is an additional option: "Send search statistics to the server (Recommended)". This enables sending anonymous statistics of lyrics search requests, which helps us improving our services. To apply any changes you made, click the "OK" button. This will close the settings window. Now you can start downloading lyrics for your songs using the new settings.